In honor of Father’s Day this year, I thought it was long since time I wrote a piece on the man responsible for bringing you the Kensington Chronicle 7 days a week 52 weeks a year, my father and our editor in chief, George Darling. And how, if not for a chance meeting more than 30 years ago at the Neverland Train Station, I wouldn’t even be here. As you can no doubt imagine, it takes a certain kind of person to run a newspaper day in and day out. 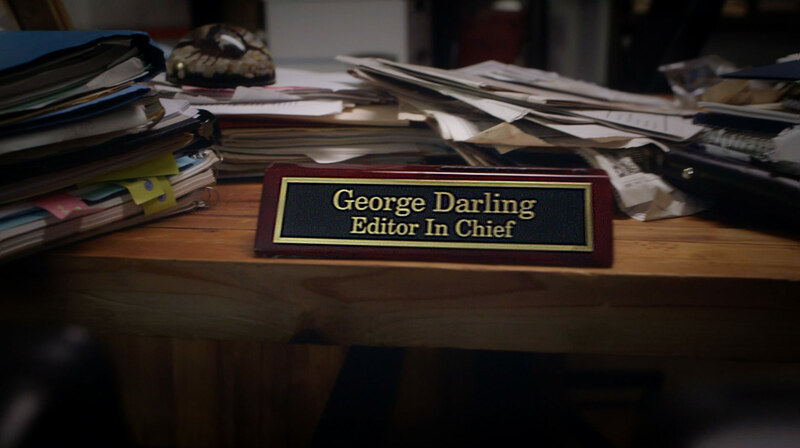 George Darling is driven, organized, and knows how and when to delegate. But believe it or not, my father was not always the taskmaster he is today. Though George is loath to admit it himself, my grandfather, David Darling, has imparted to me on more than one occasion that in his formative years, my father was relatively aimless. David Darling saw his son’s potential, but feared that George was in danger of squandering it. George, for his part, wanted the freedom to make his own choices, and in those days, being groomed to take over the family business was the furthest thing from what he wanted. David Darling was ultimately able to impress upon his son the importance of getting a college education, and George begrudgingly enrolled at Neverland University, from which he emerged four years later with a degree in English and Journalism. But this was far from the last time George and his father would engage in a heated debate about the direction of his life. Not long after graduating, George and David would have the most contentious fight of this kind to date. At an impasse, a furious George stormed off, intent on fleeing Neverland for parts unknown. But fate had other plans. It just so happened that the woman working the ticket counter at the Neverland Train Station that fateful day was one Mary Davies. To hear my father tell it, once he locked eyes with Mary for the first time, the rest of the world faded away. She was the most beautiful creature George had ever laid eyes on, and from that moment forward, he never thought about leaving Neverland again. For much of my life, I’ve harbored the belief that romantic entanglements are a distraction, at best. But in recent months, I’ve begun to revise that opinion. I’ve seen evidence of how the right pairing can create a union that is far greater than the sum of its parts. And this was absolutely the case with George and Mary Darling in the early years of their courtship. Now, starting a family was at the forefront of George’s mind, and he decided to put his journalism degree to good use. Much to David Darling’s relief, his son finally agreed to follow in his footsteps, and Grandfather could rest assured that the dynasty of Darlings at the helm of the Kensington Chronicle would continue, unabated. And, of course, for my money, the most important result of the union of George and Mary Darling is their three children, myself and my siblings. I, personally, have been a newspaperman from the womb, and the paper will be in good hands when my father does decide to retire. So we at the Chronicle wish George Darling, and all of you other fathers out there, a very happy Father’s Day. We owe all of you a debt we can never possibly repay. 1 Pings/Trackbacks for "The Importance of Being George"